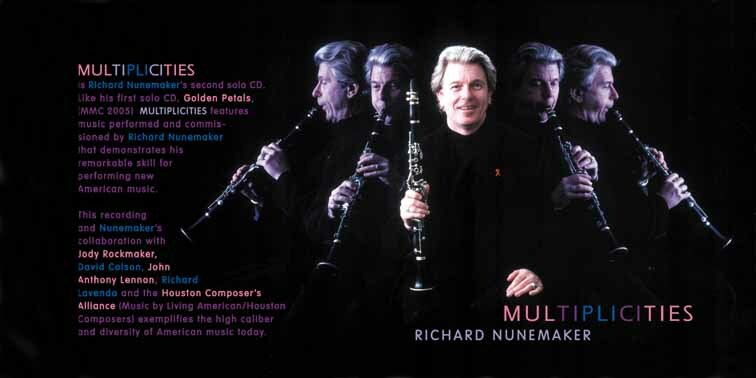 Multiplicities is Richard Nunemaker's second solo CD. Like his first solo CD Golden Petals (MMC 2005), Multiplicities features music performed and commissioned by Nunemaker, demonstrating his remarkable skill for performing new American music. This recording and Nunemaker's collaboration with Jody Rockmaker, David Colson, John Anthony Lennon, Richard Lavenda and the Houston Composers' Alliance exemplify the high caliber and diversity of American music today.